This blog as been almost entirely devoted to the Texas Advance Directives Act ("TADA") because it is something that I think is so incredibly vital and affects everyone. It is also something that few know about, much less understand. End-of-life or denial-of-care issues, while just as much a part of the pro-life movement as abortion, are the stepchildren of that movement (stepchildren locked in the basement, that is). I think this is a crime. It is short-sighted and there are precedents being set, and laws that are in place now, that are killing people. This is not hyperbole, but the cold hard facts. From the very beginning, I have written about TADA, the efforts made to reform it, and the work that remains to be done. It is clear that although there were very limited reforms made in the last session (that some overstate and claim fixed this law entirely, making it a model for other states to emulate), this is still a very dangerous law in need of tremendous re-writing if not outright repeal. There is much left to be done and tremendous effort will have to be undertaken to address this draconian law in meaningful and substantive ways. Of course, there are many good, pro-life doctors and medical staff. However, there are some that have what can only be described as a philosophy in favor of euthanasia. Related to this is a philosophy that medical professionals should be able to make decisions about whether you receive care at all, that is, whether you live or die, regardless of what you want. I wrote about that philosophy when PolitiFact wrote a hit piece on the subject of SB 303. Using the medical profession's own words, it was easy to expose this not-too-subtle support for euthanasia of those who the professionals declare are unworthy of life. Even if they are few, it only takes a few doctors and staffers who think like this and a medical ethics committee that will back them, to take lives under color of law in Texas. This must be stopped. Let me give you a very clear and current - as in happening right this moment here in Texas - example of all that is wrong with this law and this mentality that so often exists within hospitals and the medical profession. Meet Chris Dunn, a man who has served Texas as an EMT in the Harris County Sheriff's Office and a Homeland Security employee. Methodist Hospital and Dr. Marc L. Bloom have decided that he has no right to life and have been seeking to withdraw care from him (his ventilator) which would kill him and/or administer medication to him that will kill him within 3-4 minutes. Methodist Hospital has decided to do this against his will and against the will of the family member who is making his medical decisions for him when he is unable to, his mother. This hospital - like every other hospital in Texas - is able to do this under TADA's Section 166.046. Texas Right to Life has been on the forefront of this battle against TADA for more than a decade. No other organization is more directly involved in trying to right the wrong that is TADA than Texas Right to Life. It is the only pro-life organization that helps patients and their families navigate this process. It is the only pro-life organization that helps find facilities willing to take these patients when the facility they are in decides their lives are worthless and attempts to withdraw care so as to kill them. People, this is NOT Obamacare. It has nothing to do with Obamacare, although that this would be an excellent roadmap for how to implement death panels in Obamacare. It surprises almost everyone to learn that this has been the law in Texas since 1999. Under this draconian Texas law there is no real due process for patients when a doctor and hospital decide to withdraw care. There is no appeal of the merits of a case to court. The most any patient can attempt to do is get more time to find another facility to take the (families are given only 10 days' notice), but that is not always possible for a myriad of reasons. The Texas Medical Association has a strong lobbying arm as does the Texas Hospital Association and both fight every attempt at reforming TADA. I have covered this before. Tragically, certain pro-life groups and the Texas Catholic Conference of Bishops (with the lone exception of Bishop Emeritus Gracida) have also opposed meaningful, substantive, and more comprehensive reform that would make this law more patient-centered and more pro-life. You can read just about everything I've written about this, as well as Bishop Gracida's blog, and learn more about what true reforms have been offered, what faux-reforms have been offered, and what organizations supported which. In the case of Chris Dunn, not only is the hospital fighting to kill him through denying care and/or administering medication to hasten his death, it is also fighting to take over legal control of him by fighting to obtain custodial guardianship over him. Let me restate that: the hospital wants custodial guardianship over the man they are seeking to kill through denial of care which is what they have done so far by refusing to find out what is causing his illness, removing his ventilator, and/or outright administering medication to him that will kill him almost instantly. This hospital seeks to control his fate through a legal guardianship despite the fact that Mr. Dunn's MOTHER is the one who can do this task and has been. Why on earth would a hospital fight for this right? It is not as if this man has no family to do this job. Trainor insisted on a distinction between life support, which is a life-and-death situation, and life-sustaining treatment. Chris is "not being fully kept alive by artificial means" and therefore technically not on life support. "They cannot tell you what is conclusively wrong with Mr. Dunn. ... [T]hey say he shows signs of having pancreatic cancer," Trainor said. "But they have not done a biopsy." Trainor also noted that if Chris has pancreatic cancer, such a condition is treatable. In cases where pancreatic cancer is fatal, the prognosis is a very short time. "But Chris has been in the hospital for nearly eight weeks now," he noted. So, one might ask, why is the hospital opting to withdraw treatment instead of trying to determine Chris' condition and treat it? Why is the court even considering the possibility that the hospital should be gaurdian? You can read more here about the procedures the hospital will and will not do and how often the reasons they give for denying needed care are illogical and inconsistent. But let's be clear about this: Mr. Dunn is not on life support. He needs life-sustaining treatment which the hospital not only does not want to give, but wants to prevent him from getting elsewhere either by not giving him enough time to transfer to another facility or by taking over his medical decision making so as to kill him. Moreover, what the hospital claims is wrong with him, but will not confirm, may very well be treatable but is being allowed to get worse by the hospital's delay while it tries to kill him. (Incidentally, the hospital is unlikely to face any medical malpractice claim for this blatant negligence because of the protections in TADA.) This is evil. This is not pro-life. This must stop. Make no mistake about it - the hospital is seeking to euthanize this man. His mother explains what the hospital told her: "'They want to come in and unplug life support [the term the hospital is using] and administer a comfort drug, or comfort care,' she says, 'And he will pass within 3 to 4 minutes.'" The hospital wants to administer a drug that will kill him in 3-4 minutes. That is euthanasia which is supposed to still be illegal in Texas. This is such a dangerous precedent but what we have all known goes on pursuant to TADA. This is why we fight it so hard against it. Note please: When a medical professional says "comfort care" understand that increasingly is code for what the hospital here seeks to do - administer medication so as to hasten death. It is not merely pain medication given at a dose to alleviate pain. And it is not merely an unfortunate secondary effect of it. Increasingly, pain medication is given at a dose so as to hasten death as its primary purpose. We have seen this time and again. The two uses of pain medication are not the same in intention or morality. Understand also that this is not a comatose man (even if the comatose state made euthanasia against your will morally or legally appropriate - it is not), this is a man on the video above who wants to live. He has clearly expressed that. HE IS, WITH FOLDED HANDS, PRAYING FOR THAT. The hospital does not care. The doctor does not care. Texas law does not care. Trey Trainor and Joe Nixon are fighting a valiant, necessary fight - not just for Mr. Dunn but for every Texan - in challenging the constitutionality of this law. But you can help, too. Pray for a change of heart among those who make these decisions. Pray for a change in Texas law next session. Pray that those who support TADA - the TMA, THA, some pro-life groups, and the Texas Catholic Conference of Bishops - have a change of heart and mind about the matter and work with us to change this law if it is not declared unconstitutional before the 2017 legislative session. Pray for good legislators to be elected who will see this law for what it is, introduce real reform legislation, then pass it. 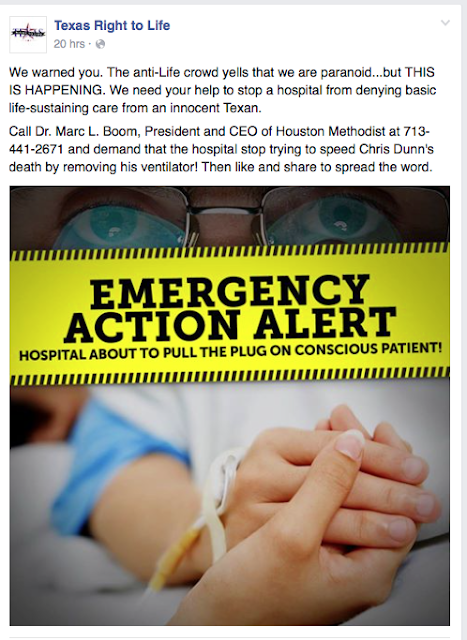 Third, you can also tell Houston Methodist to keep Chris Dunn alive by commenting on their Facebook page and/or emailing their president, Dr. Marc L. Boom, at mboom@tmhs.org. As to the comments in the picture above, yes, we have been told we were alarmist by anti-lifers. We have tragically been told (by pro-lifers and pro-life orgs.) that this issue takes up too much time and energy from the "real" pro-life issues. We have been told that when this as made an issue in the primaries in 2014 that it was not that big of a deal and we had lost our way. We have also been told by the TMA and pro-life groups that support TADA that this law is rarely ever used and only in cases where continuing care would harm the patient. That is patently and demonstrably false. Mr. Dunn's case is just the latest and has received more publicity, but you would be shocked to learn how often this happens. There is nothing to stop a hospital from doing this. There are NO LEGAL RAMIFICATIONS. Hospitals and doctors operating under this statute are totally and completely IMMUNE from any liability whatsoever. As I have written before, and as I said in my testimony opposing the first version of HB 3074, the family and I were told by a doctor during one of these medical ethics committee hearings seeking to kill a patient that, “In nature, when people are immobile this long, they get eaten.” That is the mentality of so many doctors and hospitalists who use TADA. To doctors who say things like this, humans are merely animals that we euthanize like those at the pound who are not adopted. Humans have no other value, no souls, no worth if they are unable to work a 60 hour week with no disabilities, no difficulties. If these human specimens are not perfect in every way, they are at risk. We have to combat this on every front we possible can. What a shameful legacy TADA is for Texas! I love Texas and I say we can do better. Rather than having the worst such law on the books in the nation, we should be leading the way in patient protection. You are only one hospital stay away from being the next victim of TADA and certain medical professionals who think they have the right to euthanize you. Texas law may not allow euthanasia directly, but the way that TADA is used very much results in the same outcome. 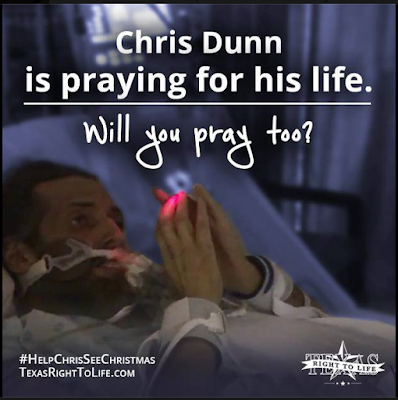 In the meantime, we must do everything we can to save Mr. Dunn and #HelpChrisSeeChristmas. You can keep up with his status by "liking" Texas Right to Life's Facebook page and also by liking this page dedicated to Chris' fight. P.S. There is one more thing you can do. Fourth, you can oppose any politician who has worked against efforts to make true reforms to TADA. I know of one district in particular where there is a very good chance for real change which will help all of Texas, that is, the district currently represented by Byron Cook. Cook sat on the committee last session that took up TADA reform. His attitude, demeanor, and words - before, during, and after the hearing - made it clear that he was and is no friend of those of us that work to reform TADA in a meaningful way to save lives. Consider his alliances with the organizations who also opposed true reform of TADA and that completes the picture. Fortunately, he is being opposed in the primary by Thomas McNutt who has received Texas Right to Life PAC's endorsement. You can help even if you do not reside in that district and cannot vote for him by spreading the word to those who can vote, volunteering in his campaign, giving financially, etc.